In Australia 41% of teachers report high levels of occupational stress. In the United States 46% of teachers report feeling stressed daily. In the UK 81% of teachers experience depression, anxiety, or stress at work. (Donna Cross 2016, Milburn, 2011; WorkCover, 2014; Michael, 2014; Education, 2014: Teacher Stress, 2012). Teacher wellbeing is paramount in the classroom if students are to achieve academic success. Teacher wellbeing and teacher stress are strongly linked to student wellbeing and consequently to student achievement. 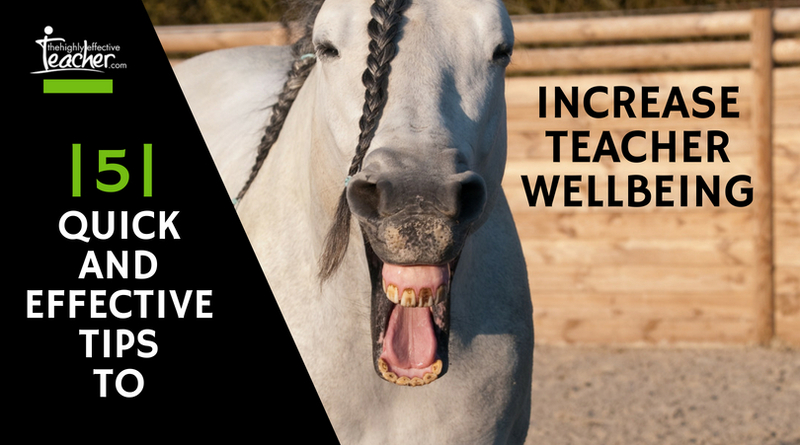 A teacher who prioritises their wellbeing using a variety of strategies to cope with the inevitable stress, is more likely to be resilient when the going gets tough and an inspiring role model for students. A teacher who succumbs to stress is a less effective teacher because they are less able to manage the varied demands of teaching. Stress, however, is not what happens to us, it is our response to what happens, and our response is something we can choose (though it may not always feel like we can!). Just to name a few! To learn more about how you can improve teacher wellbeing, go to Teacherwellbeingworkshop.com for more information. Teaching can get on top of the best of us and it helps to have simple strategies to manage your emotions. These are wellbeing tips that you can use on the spot, at school, when the stress creeps in. Simply taking a deep breath when you feel overwhelmed can help you calm. Taking a breath has a positive effect because when you breathe deeply it sends a message to your brain to calm down and relax. When you are stressed your body responds with increased heart rate, fast breathing and high blood pressure- deep breathing makes your body feel like it does when you are relaxed. Even 10 minutes of moderate exercise can make a difference to your state of mind-if you can do it with your class even better- dance, run, hop, skip, jump, walk, wriggle and jiggle. Give your students a task to come up with a funny story. Do a laughing exercise with your students like standing in a circle and making each other laugh. Play a game like Make the King Laugh or You know I Love You, but I Just Can’t Smile. These games can be included as part of your lesson either as a reward or to engage emotion with the learning. Relationships are the best predictor of wellbeing. Teaching can be an isolated profession. Connect with colleagues and ask for help if you need it. Connect with students by listening to them and sharing something of yourself. Introduce a gratitude exercise with your class like a gratitude journal or a gratitude jar. Writing and talking about the things you are grateful for has positive effects on your wellbeing and levels of stress in your life. Accepting that teacher stress is going to happen and being prepared to manage your own wellbeing is crucial to dealing with demands effectively. Having simple strategies you can use at school will increase teacher wellbeing and improve student achievement.